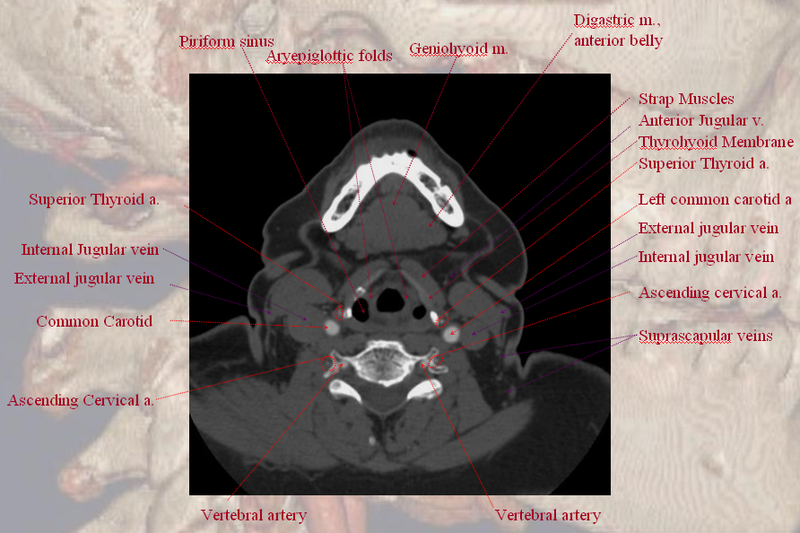 The inferior thyroid artery typically arises from the thyrocervical trunk immediately distal to the vertebral, but on occasion can come proximal to this location, including aortic arch and subclavian arteries. This variant is known as the “Thyroidea Ima.” It primarity supplies the thyroid gland and is in balance with the superior thyroid artery. 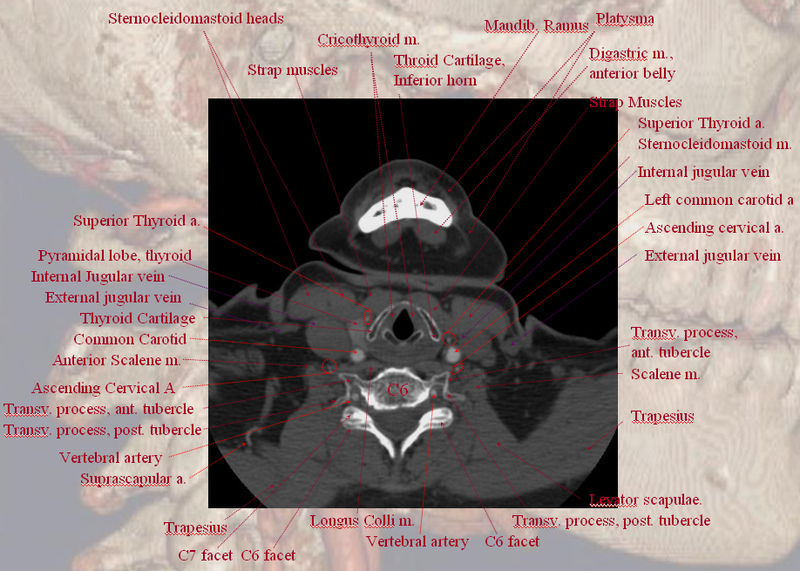 The superior thyroid artery is typically the first branch of the external carotid artery. 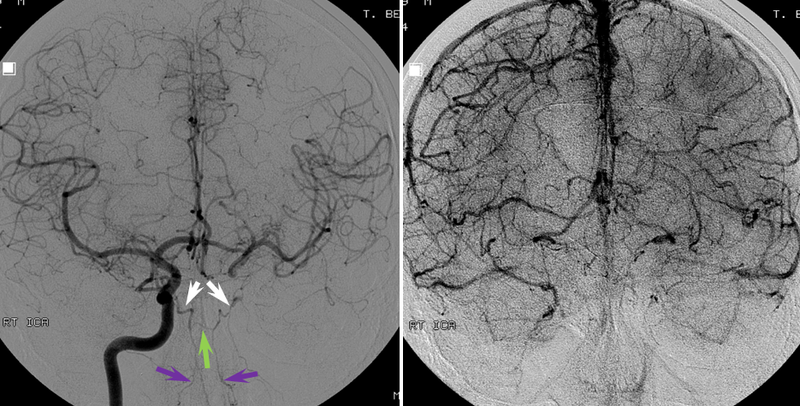 Most of its flow directed into the thyroid bed, with a characteristic thyroid blush on catheter angiography. It is very often seen on a (well-performed) CTA. A superior laryngeal branch often arises from the superior thyroid artery. Penetrating the thyrohyopid membrane along with the superior laryngeal nerve of the vagus nerve, it supplies stuctures of the larynx and hypopharynx. 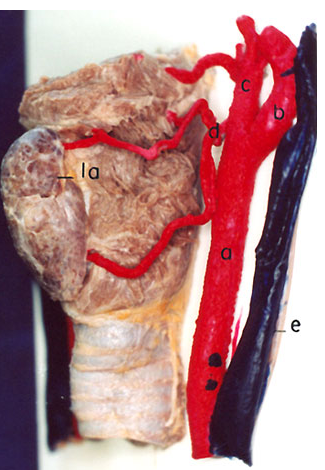 Extensive anastomoses with its contralateral homologue, and with other vessles supplyng this region. The main Sup. 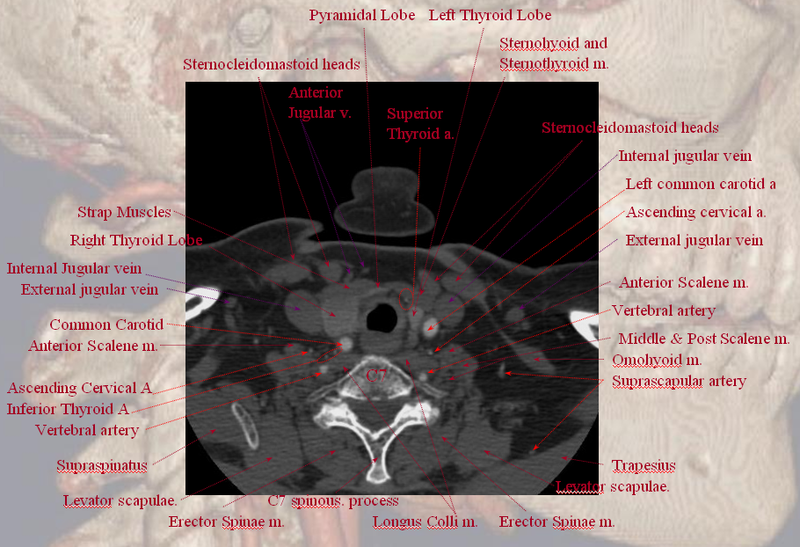 Thyroid then divides into multiple branches vascularizing the thyroid gland. It is in balance with the inferior thyroid artery, which typically arises from the thyrocervical trunk, or less commonly from the aorta (thyroid ima) or elsewhere. The superior thyroid artery gets very little press, often a paragraph smaller than this no pictures at all in the major neurointerventional volumes. It is indeed of relatively little importance. 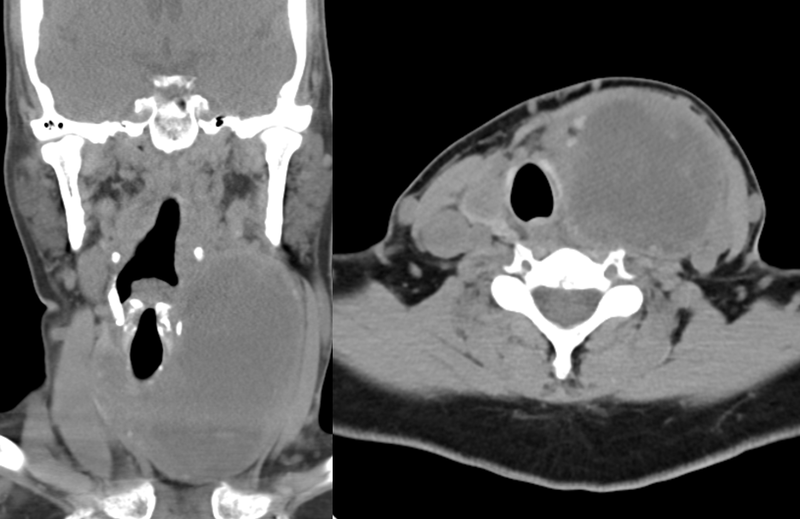 A well-done CTA showing inferior thyroid branches on the right and superior thyroid on the left. 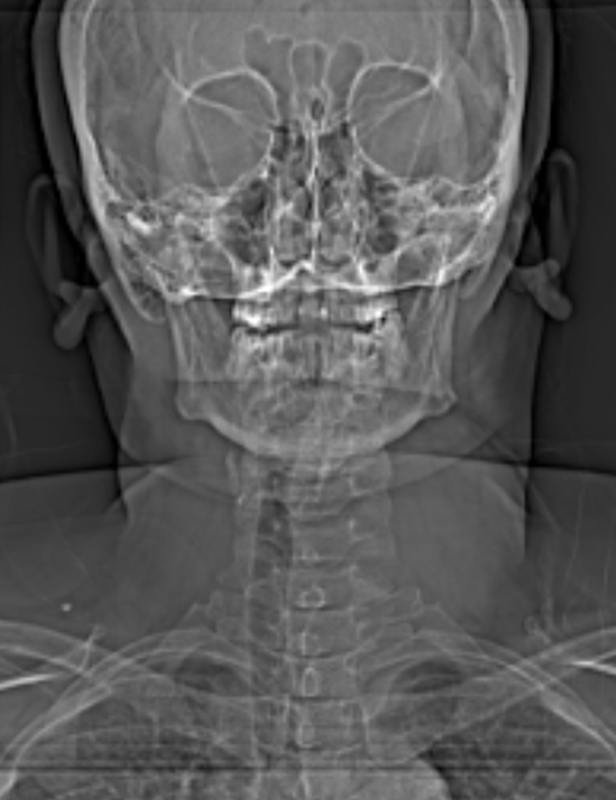 A C6 level image demonstrating bilateral superior thyroid arteries. An oval marks the location of the right superior laryngeal artery, which you have to believe me was actually seen on a PACS monitor. A different patient. 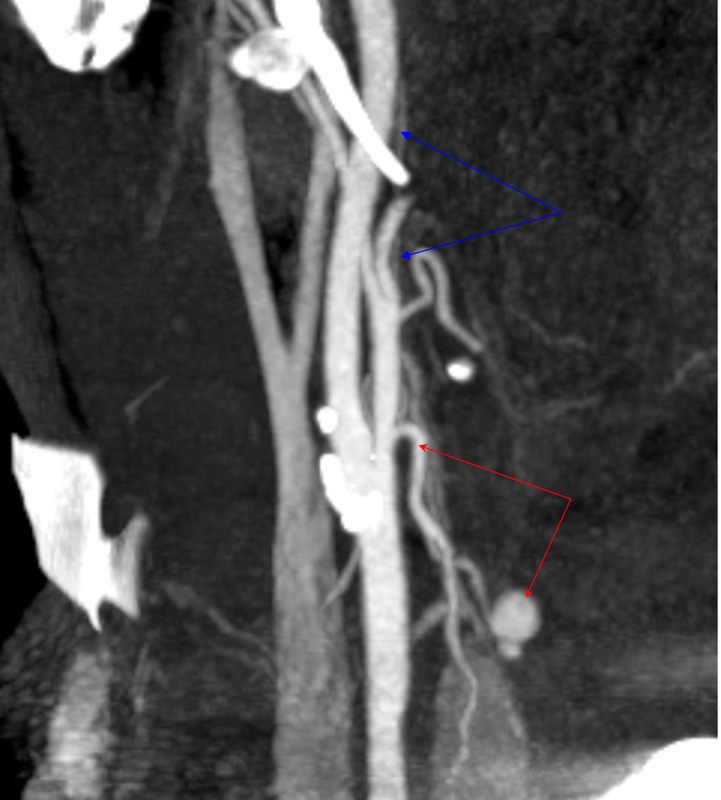 Curved CTA MIP image demonstrating a large Superior Thyroid artery with a post-surgical bleeding pseudoaneurysm of one of its branches just above the thyroid lobe (status-post parathyroidectomy). 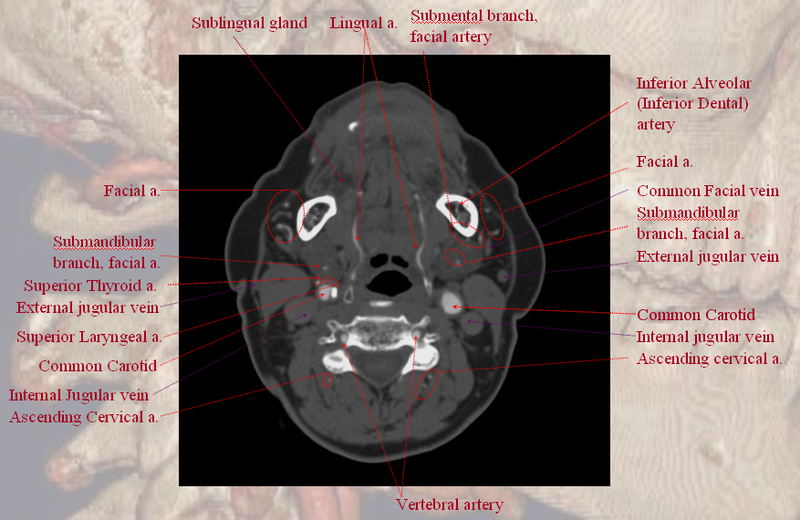 The ascending pharyngeal artery is also visible, as well as a healthy carotid bifurcation. 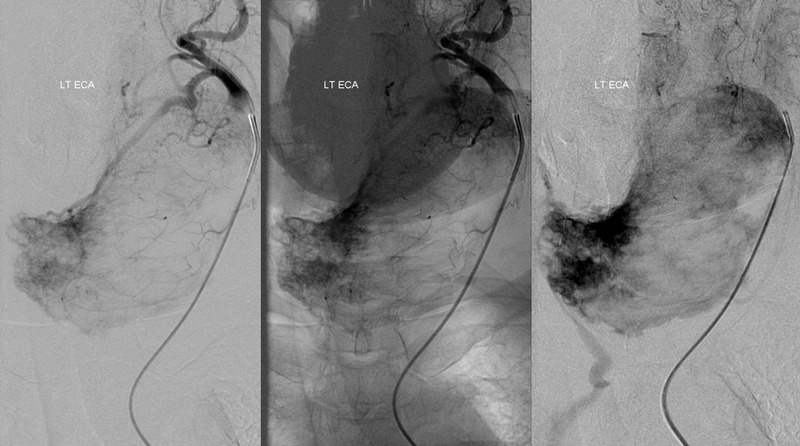 Notice prominent opacificaiton of the jugular venous system, normally a consequence of poor CTA timing, but in this case potentinally helpful to better fill the pseudoaneurysm. Thyroidea IMA — when the inferior thyroid artery arises proximal to its expected thyrocervical trunk origin, whether from the arch or from the subclavian, thats what you call it. In this case, the ima (black arrowheads) it takes off prior to the vertebral (red arrows). From S.R. Satti, C.A. Cerniglia, and R.A. Koenigsberg. 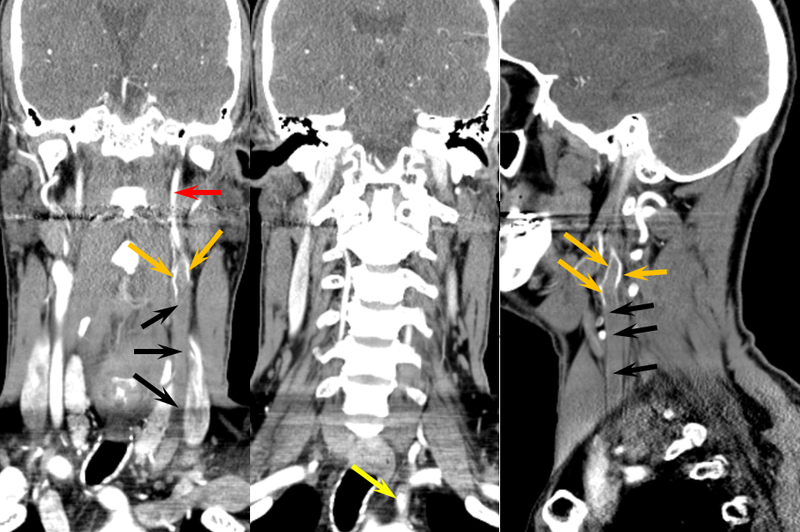 Cervical Vertebral Artery Variations: An Anatomic Study. AJNR Am. J. Neuroradiol., May 2007; 28: 976 – 980. 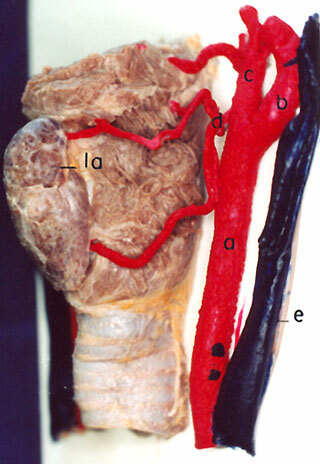 There is a dedicated Collateral Circulation page, where these things are discussed in greater detail. There is no limit to the collateral potential of the body, especially given time. This case is more than simple rarity — it illustrates the potential for tissue level reconstitution. 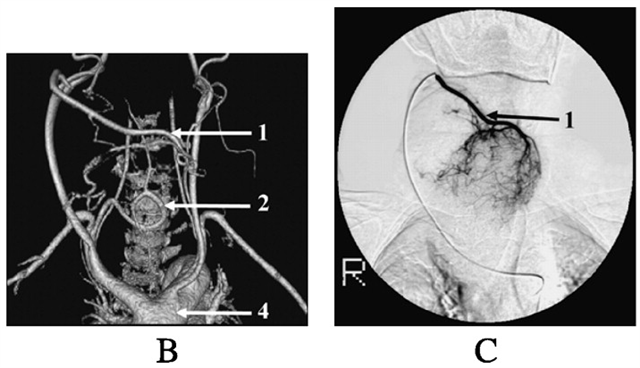 Thyroid and other highly vascular organs have richly interconnected capillary and precapillary networks and can very efficiently resupply themselves in cases of all but extreme constraints. Who ever heard of thyroid gland necrosis due to ischemia? 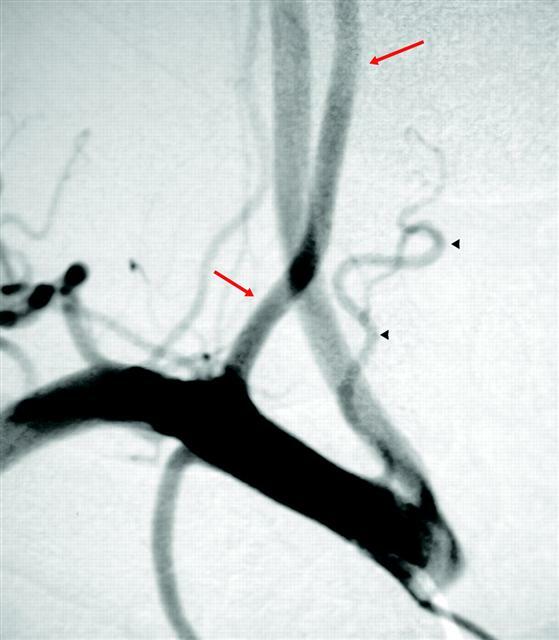 In this patient, a humongous clot (black arrows) extends across the entire left CCA: A reduced caliber ICA (red) is reconstituted by streams of contrast at the distal edge of the clot (orange). 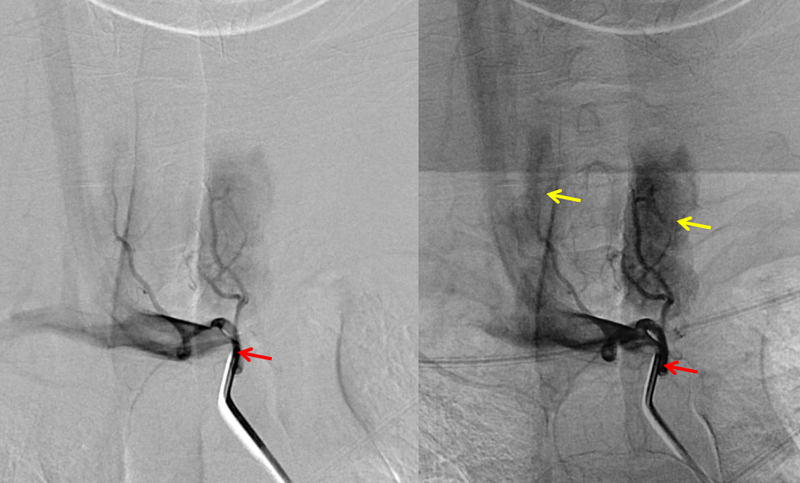 The proximal CCA stump is in yellow. The patient is doing fine, thanks to a large ACOM. 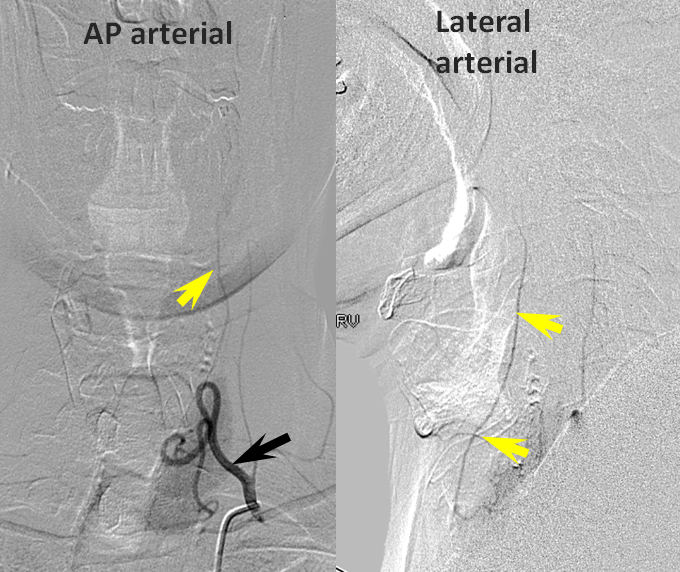 It is always best to estimate angiographic collateral reconstitution in the venous phase of the control side (image on right). Also notice nice MHT-to-MHT anastomoses (white) across the clival arcade (green), with ascending clival branches (purple) of the Ascending Pharyngeal Artery. 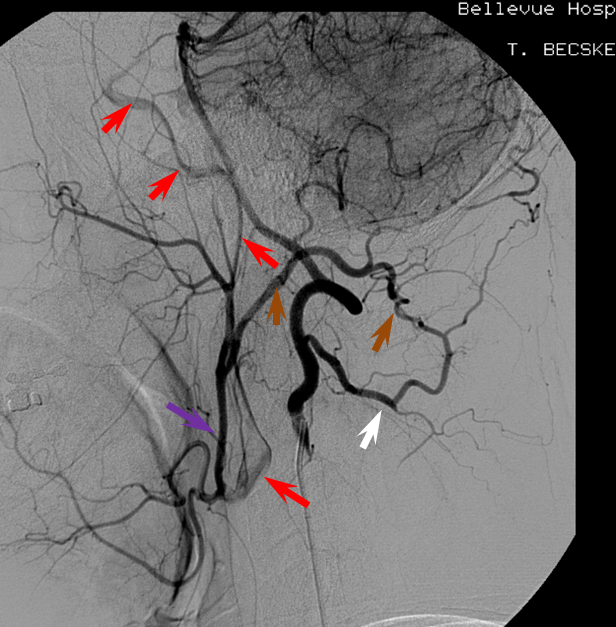 The internal carotid artery (red) is primarily reconstituted through the ECA (purple) at the level of the carotid bifurcation, in this case via the vertebral artery C1 muscular branch (white) anastomosis with the Occipital artery (brown). This recreates the Proatlantal type 1 disposition — Proatlantal artery is nothing but Occipital to vertebral anastomosis at C1 level. Other examples are found on the Occipital Artery page. 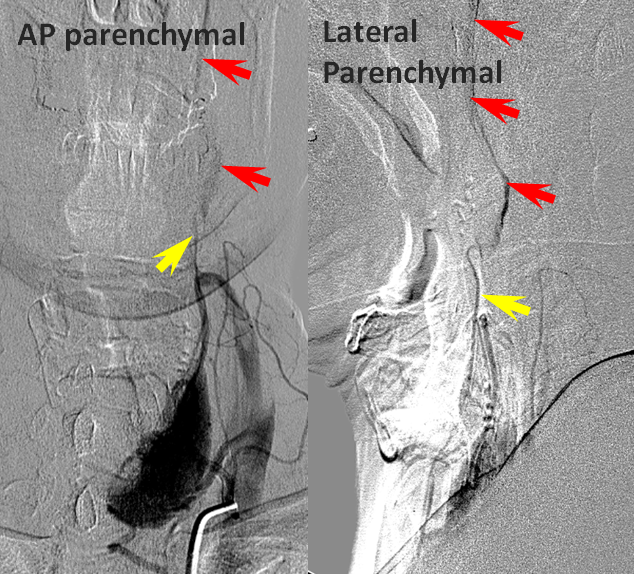 Later images, in thyroid parenchymal phase, show superior thyroid (yellow) participation in ipsilateral ICA (red) reconstitution at the level of its proximal external takeoff.